I have been asked by Energetic Mama to do a guest blog for them – thought you might like to read it too! I’m Mum to Runi who will turn 8 in May – he’s the light of my life. Married to Toby for 13 years (lucky for some ha ha!). I was born in Scotland and lived there until I was 28 when I went off to travel! No itinerary whatsoever and was pretty surprised to find myself in Australia! Came to Adelaide and re-met Toby; we had met in Turkey a couple of years earlier. 6 months later we were married – wow! I live in the amazing Aldinga Arts Eco Village, surrounded by many like-minded people. I am so blessed to be part of this supportive community. I set up a food business Thistle Be Good back in 2002. We work out of a little factory in Willunga (although I am office based from home now). 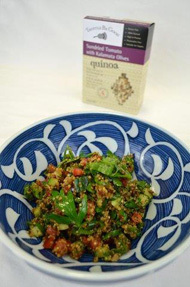 We make ready to cook flavoured quinoa, risotto and couscous along with a range of dukkah and Spice Rubs. Our products are all natural with nothing nasty added. They are real food. I eat clean, local food when possible. Local organic is great but I tend to go for local over imported organic. Never buy pre prepared foods unless it’s the occasional fish and chips! I remember wandering around the supermarket when my boy was a few months old, looking for ‘convenience food’. I really had no idea what to look for – came home with a yucky jar of pasta sauce ha ha! I eat red meat once or twice a week (mainly kangaroo – Macro Meats fillet is amazing! ), oily fish once or twice and usually vegetarian the other nights. Big salads for lunches most day or corncakes for lunch if I’m pushed for time. Can you share a healthy recipe with us? My quinoa tabbouleh has to be one of my favs. 1. Cook your quinoa as per instructions (I use my Sundried Tomato and Kalamata Olive one) and allow to cool. 2. Add finely diced tomato and finely diced half of a red onion. 3. Add a good amount of chopped parsley and mint. 4. Add the juice of 1 lemon and a glug of good quality olive oil. 5. Mix together and there you go – easy peasy but so tasty and healthy! Can you share a healthy lunchbox idea with us? Hmm, my boy always has a peeled carrot, yoghurt and today he had a mini veggie muffin (he thinks they are a treat but they are chock full of finely chopped veggies!). I make a batch then freeze them – works beautifully. I go to a group every week in the village called ‘Yarning Circle’. We sit around and do knitting for baby blankets for village babies, mending etc. It sounds really boring eh? It’s hilarious! We hang out for 2 hours, drink tea, eat chocolate and laugh! I love it and rarely miss it. I also love to read and going to the gym on my own makes me feel great! I try to go the gym two or three times a week (usually it’s two sadly) and I do a ‘big’ ride on a Sunday with my bestie. Ride from home for approx. 40 km. Used to do more but usually time’s a bit of an issue. What is your number 1 tip to help my Energetic Mamas feel their best? Say no to people. I used to say yes to most things but when I turned 40, I changed it. It’s very liberating.